Ewa Cybulska: [standing in line at Ellis Island speaking Polish] We're almost there. Ewa Cybulska: We'll find Aunt Edyta soon, and we'll be safe. We'll be together. We'll make our own families, have lots of children. i cannot believe this movie got no Oscar consideration this year. both Joaquin phoenix and Marion cottilard deserved Oscar nominations for best actor and actress. i like this movie over " American hustle " and Joaquin's performance was brutally good, especially the last few moments of the movie where it was not sappy but i wanted to cry anyway. it is a f*ucked-up world we live in an its very hard not to desensitize ourselves, which to a degree everybody does. OK, this movie probably had a lot of production problems, like one of the reviewers said that he caught the 95 min. version and i actually watched the 2 hr. version and that was to short of a running time. this has the feel of an epic movie and the actors and actresses were superb in this movie. i think someone needs to hang or shoot the scriptwriter cause everything else about the movie was awesome. the basic story is set in early 1920's new york city,and its about 2 sisters from Poland( how good is Marion's polish? ) immigrating to America and arriving on Ellis island. her younger sister is sick and quarantine and waiting to recover and be deported. she is about to be deported also because her sponsors( aunt and uncle )never arrived to pick them up. in swoops Joaquin phoenix to rescue the day and get her out of Ellis island and to downtown Manhattan. oh...BTW, did i mention that he is a pimp and hustler and finds a lot of the girls fresh of the boat who are in dire situations by bribing the guards. ...that is as far as i want to go with the story, it really is a must see movie but make sure you get the longest version possible not the 95 min. one. this movie dwells on the darker side of immigrant life and that America is not the utopia everybody makes it out to be. the streets ain't paved with gold and life was often very hard. i want to give a shout-out for jeremy renner, he looks very debonaire and suave with the short-cut and the pencil moustache. he played the lovable loser cousin of phoenix and was a delight. why no Oscar consideration for this movie this year??????. this movie had 3 a-list actors who gave very good performances, set production was gorgeous( everything looked dreary and old like its suppose to ). 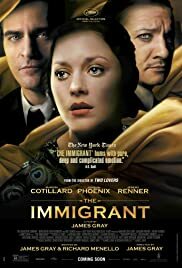 i don't know if there was cgi involved for the Ellis island scenes, but it was very well done and even new york city in the 1920's was well done. the last scene between Marion and Joaquin is worth the price of admission alone and i just wish this bittersweet movie was at least a 1/2 hr. longer. maybe it'll make next years Oscars as it has not officially been released here in the states yet and they can fix it up before then, it just needs a little touching-up here and there thats all. wanna watch a really good movie? well this is one of the best of the year in my opinion. enjoy!